Parakeets and Goldfish Bowl By Louis Comfort Tiffany, Glass, lead and bronze chain, c.1893. Saturday Evening Girls ceramic artist Sara Galner (American, born Austria-Hungary, 1894â€“1982) Bowl, 1916, Earthenware with glaze. 2 Â¾ x 8 Â½ in. Museum of Fine Arts Boston, Promised gift of Dr. David L. Bloom and family in honor of his mother, Sara Galner Bloom. At the new Art in the Americas wing at the Boston Museum of Fine Arts, most of the objects on display had a practical function. The beauty and design integrity are part of their historic and aesthetic meaning. Creatively, the Art of the Americas curatorial staff has strategically placed selected pieces near paintings and sculpture to underscore the historic or artistic period or genre in which the galleries are categorized. Made up of 49 galleries and four (4) educational rooms, spread over four floors the Art of the Americas Wing transports the visitor from Ancient America through Native American, 17th Century and Maritime Arts, through 18th Century Art of Colonial America, early 19th Century Art to 19th century, early 20th Century Art, to 20th Century Art through the 1970s. This is done in very human scaled spaces that showcase paintings and two dimensional pieces integrated with three dimensional objects. This works most of the time. The well-founded criticism for exhibits of three dimensional (versus just paintings or two dimensional) objects, including furniture, jewelry, appliances, etc., is that they can be presented as retail store displays or visions of someone's living room. The latter is true especially when three dimensional objects are set in tableau or as a vignette with two dimensional paintings, drawings, prints or other wall hangings. For the most part, this has not happened at the Art of the Americas wing of the MFA. Instead, the curators have most often skillfully worked with the MFA's designers to integrate decorative arts as objects of desire within distinctive, often elegant, spatial arrangements. Beginning with objects from ancient America, the variety of pieces have been chosen as, not only great archeological examples, but truly individual masterpieces of extraordinary beauty and frequent charm. These pieces demonstrate visually and contextually the encyclopedic nature and quality of the MFA's holdings. There is an awesome depth and breath to this collection. Because of its vastness, the Art of the Americas can be looked at and studied in many different ways. A focus on object types, such as bowls, jewelry or furniture, a focus on period, Colonial, late 19th Century or Mid-Century Modern, as well as just looking at individual master works throughout the millennia, can all be satisfying visual journeys. There are several other approaches that will be explored by scholars, students, and appreciative museum visitors. Due to the extraordinary quality of the pieces of the collection, to discuss a number of dramatic masterpieces can only whet the appetite for future courses of a aesthetically delicious Museum of Fine Arts diet. Treats are included of varying tastes and sophistication. 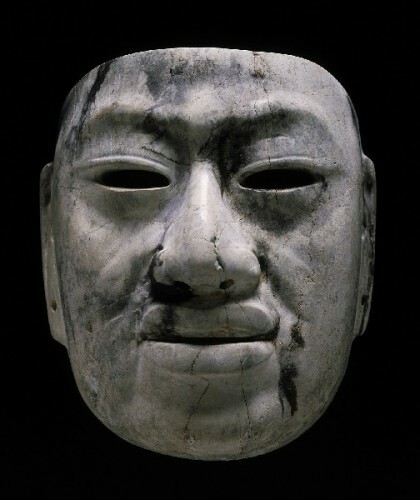 Starting with an amazing Olmec Mask, a fleshy face carved from jadeite. It is located in a gallery with large decorated funereal pots. There is also small, gold, Tairona shaman figure that is shaped into a bat and a beautiful Maya cup painted with male figures depicting godkings. The Mesoamerican section of the exhibit makes a case for its universal appeal, global sophistication, and Pre-Columbian panache. Later on the first level, the seminal Paul Revere Bowl, actually the Sons of Liberty Bowl, marks the end of our American Colonial period. 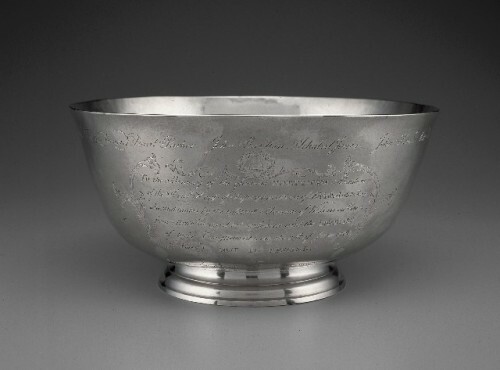 This object is literally framed by John Singleton Copley's 1768 portrait of Revere contemplating silver objects including a representation of the Sons of Liberty Bowl. This is a suggestion of the revolution to come. 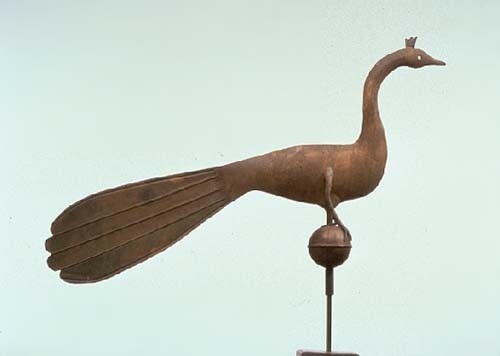 Revere's democracy is later in the wing threaded to the exquisite mid-19th Century American Folk Art Peacock Weathervane from the formidable Karolik Collection that is part of the MFA's foundation collections. This object is homely wrought however incredibly skilled in execution and aesthetic notion. It is a master work. 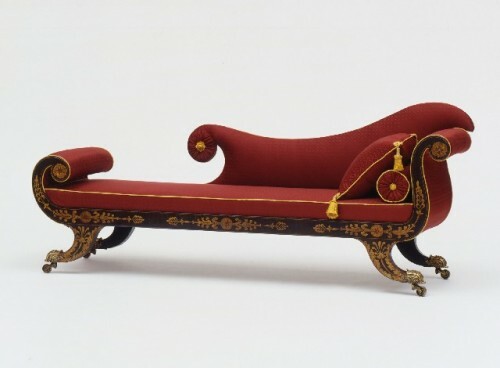 Just as is the Grecian Couch (1820s) by the firm of the Finlay Brothers furnituremakers a masterpiece as well. The elegant and curved lines of the extremely different pieces in both material, refinement, and application somehow echo each other in a stylistically confrontational way. 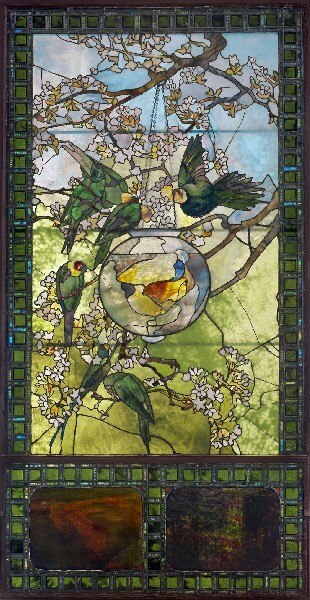 The Parakeets and Goldfish Bowl by Louis Comfort Tiffany (c.1893) is a secular homage to nature in a colorful expression that seems to have almost religious resonance similar to the best cathedral stained glass. Here Arts and Crafts Style intersects with Art Nouveau and thus Medieval craftsmanship. 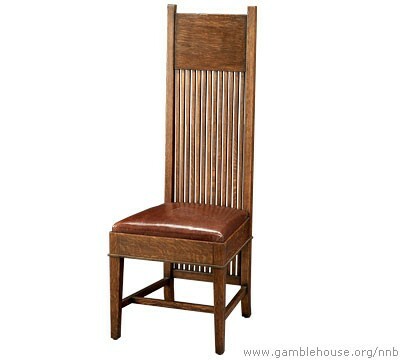 Frank Lloyd Wright's Tall Back Side Chair (American, 1867-1959, Illinois (Chicago), 1900 Made by John W. Ayers & Co., fabricated in Oak with leather, speaks to impending Machine Age modernism while acknowledging handcraft. 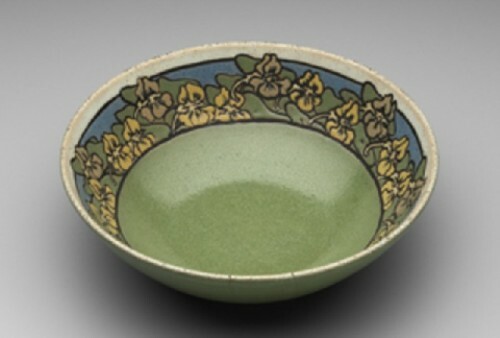 A delightful 1916 bowl by Saturday Evening Girls ceramic artist Sara Galner (American, born Austria-Hungary, 1894–1982), is made from earthenware with glaze and is 2 ¾ x 8 ½ inches. It is a gift of her son, Dr. David L. Bloom and family, in honor of his mother. This object, along with other Saturday Evening Girl pieces, bring smiles to faces by their sparkling beauty. The objects convey their wonderful story of early 20th Century immigrant girls, and young women from Eastern Europe and the Mediterranean, who made the objects under the watchful eyes of two Brahmin ceramic artists. Of course, the ceramic club was intended to keep the young women off the streets. Somehow they earned money and created museum quality bowls, cups and plates. The best of the tea sets and pieces usually had wonderfully illustrated animals on them. 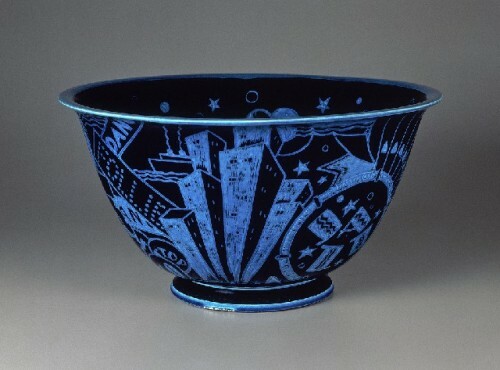 Viktor Schreckengost's blue glazed Punch Bowl from the Jazz Bowl series (1931) is from MFA overseer John Axlerod's extensive 20th Century collection. The limited edition bowls initially sold for either $25 or $50 depending on its design. Those that said "Jazz" were the more expensive ones. The Jazz Bowl is one of the iconic pieces of American Art Deco. Responsible for decades of practical yet beautiful objects, Viktor Schreckengost was the last surviving of the golden age of industrial designers. He died a couple of years ago at 104. 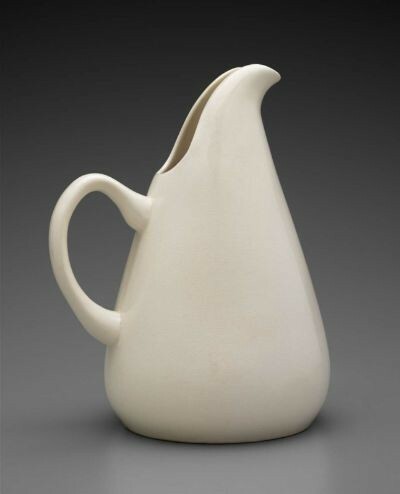 The soft silhouette of "American Modern" Pitcher designed 1937 (made 1938–1959) by Russel Wright, American, 1904–1976, and manufactured by Steubenville Pottery Company, is another more homey icon. Russel Wright was another industrial design giant. Unlike Viktor Schreckengost, who designed a variety of things for various purposes both industrial and residential, Wright focused primarily upon household objects. Wright's pitchers seem to lose steam in a repetitious display in a gallery with 20th Century modern paintings from the Lane Collection. Here, less would be more. The Studio Furniture or Studio Craft Movement have perpetuated the one-off beautiful creative object in the latter part of the 20th Century and first decade of the 21st Century. This is the unification of the designer and the craftsperson generally in an atelier or multiple worker setting. One of the recognized masters of studio craft is Judy Kensley McKie. 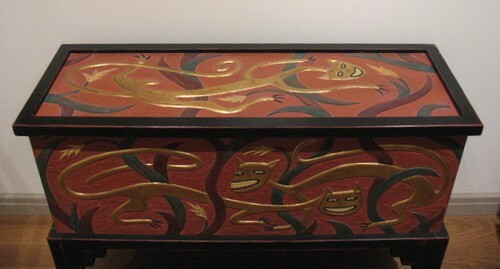 Her fantastic Leopard Chest, on display at the MFA, is made of carved Basswood and painted with oil paint and gold leaf, 1989. It is a masterpiece of Studio Furniture. 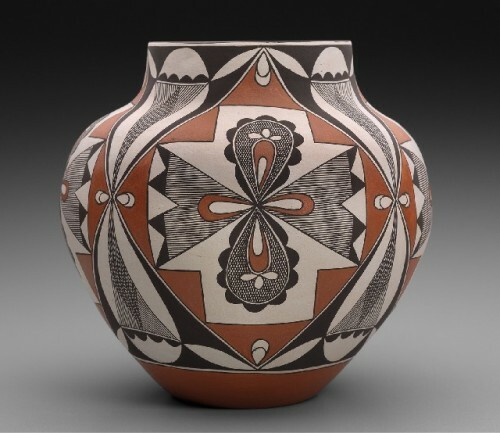 Olla, the decorated Water Jar by Evelyn Cheromiah of the Laguna Pueblo, 1993, brings the Art of the Americas exhibit almost full circle. Here, the work of a gifted member of an indigenous tribe has created a beautiful, perhaps symbolic object, similar to the Olmec Mask and burial jars of native people 3000 years ago. This thread of creativity links the three millenia and the spiritual beauty of the past and present, the pre-historic and the contemporary. Thus the Art of the Americas includes representations of the craft, tradition and creativity of the two American continents. Each visitor to the MFA's New Art of the Americas Wing will go on their own aesthetic journey, visually and contextually visiting and experiencing a life enhancing adventure. Here spectacularly beautiful objects perceptively dance with great paintings and sculpture. The creative rhythms are embracing. Eliot Bostwick Davis, the Chairman of the its Art of the Americas Department and her erstwhile curators should be congratulated.